Today I did a simple bit of spindle turning on my Titan 315. I made half a dozen large mallet heads for sale as wall decorations. I did most of the work with a square chisel. Almost any timber would do, but my customer supplied some straight-grained reclaimed pine. Not much use for a functional mallet, but OK for this purpose. Soda treatment will give them an aged appearance. The pine contained a lot of resin, which made sanding harder but made the workshop smell good. I like using a square chisel and have several. I made the one shown here from an old vehicle leaf spring. They are all carbon steel – as far as I know manufacturers don’t make them any longer. 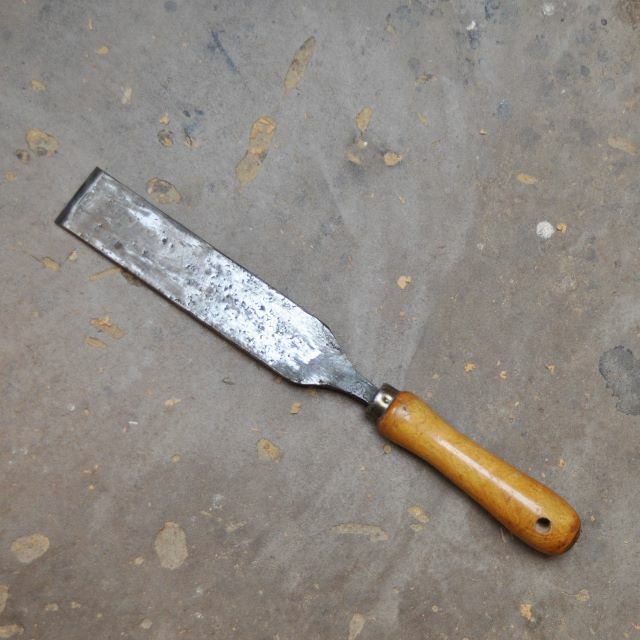 You could easily convert a modern skew chisel or scraper. They have a bevel each side like a skew chisel. The carbon steel gets blunt quickly, but flipping them over gives you a fresh edge. A wide square chisel is great for planing cuts. I think they are nicer to use for this than a skew. If they are wide, the points are easy to keep clear of the wood. So the risk of catches is minimal. They were a standard part of the turner’s kit at one time. But really there is probably nothing they can do that a skew can’t. Perhaps you aren’t confident with a skew – if not, look at my post on learning to use a skew. The mallet heads are thick in the middle with a gentle curved taper to each end, 80 mm maximum diameter and 475 mm long. I drilled the angled cross hole for the handle before turning them. This is easier than trying to get the hole properly placed in the finished item, and the turning removes any break-out where the drill comes out. The lathe handled them easily, turning at about 1500 rpm and making large amounts of curly shavings. The sturdy tool rest and firm grip on the blank seems to eliminate vibration and made the cutting effortless.